In the year 1981, the largest known bee in the world was believed to have gone extinct, and it wasn’t the first time this had occurred. The Wallace giant bee, which originated in the Indonesian rainforests, is roughly four times the size of a regular honey bee, with the females (males being half their size) possessing huge jaws as well as a six-centimeter wingspan, which is the same length as the short end of a one dollar bill. This bee, presumed to be dead and gone on more than one occasion, has once again been found out in the wild, according to a conservation organization called Global Wildlife Conservation, an Austin, Texas nonprofit and the sponsor of a dedicated search. Four entomologists (scientists who study insects) and photographers searched all over the North Moluccas in the Indonesian islands looking for the Wallace giant bee—an endeavor that is part of a global project to find lost species. After they searched for about five days, the team of scientists found one female bee high up in a tree inside of a termite nest. The Wallace giant bee builds its own nests within such structures, protecting them via tree sap they gather with their unusually strong jaws. In 1858, the Wallace giant bee was initially discovered by Alfred Russell Wallace, a naturalist, who was allegedly developing the theory of evolution via natural selection right as Charles Darwin was in the Galapagos Islands. Back then, Wallace noted this bee’s giant jaws, which had a similar appearance to those of stag beetles. 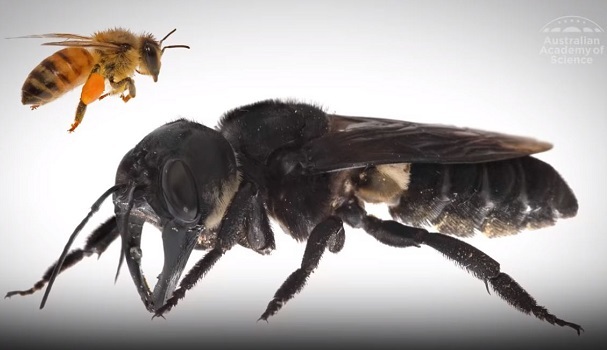 However, Wallace was also the last official person to see a Wallace giant bee until a University of Georgia entomologist in Athens discovered a few of the bees over a century later in 1981. Since then, the state of these giant bees has been unclear to the point of them being believed to be extinct—that is, until now (again). One of the suspected common threats these bees may be facing are insect collectors, who could be targeting them specifically, as per a statement by Robin Moore with Global Wildlife Conservation. Other concerns for Wallace giant bees include habitat loss, given many of Indonesia’s rainforests are getting cut down in droves for agriculture. Moore’s team of researchers hopes a conservation plan can be implemented for the rare species, with Global Wildlife Conservation hoping the overall publicity of these record-setting bees will help increase awareness for their protection.